How do you evaluate whether a professed expert on Torah and science is worth his salt? One step (of many) is to see whether he is ready to confront dinosaurs. I don't mean whether he is ready to jump into an enclosure of cloned velociraptors and stare them down. (I wouldn't do that, either.) Rather, I'm talking about whether he is ready (and has already thought about) some very basic questions. Like, when the dinosaurs live? Did they live at the same time as people? Did they all live at the same time as each other? And if so, why are their fossils consistently found in different layers of rock? Interestingly, the Christian Young Earth Creationists (YECs) are eager to confront dinosaurs. At the $27 million Creation museum in Kentucky, there are prominent animatronic dinosaur exhibits, complete with models of the humans that the Christian creationists believe lived alongside the dinosaurs. (As far as I know, they do not explain why the thousands of dinosaurs fossils are all found in layers of rock that do not have fossils of humans or modern animals.) The Christian YECs are interested and excited to talk about dinosaurs from within their religious worldview, in which they are very confident. Yet there is no parallel to this amongst Orthodox Jewish YECs. 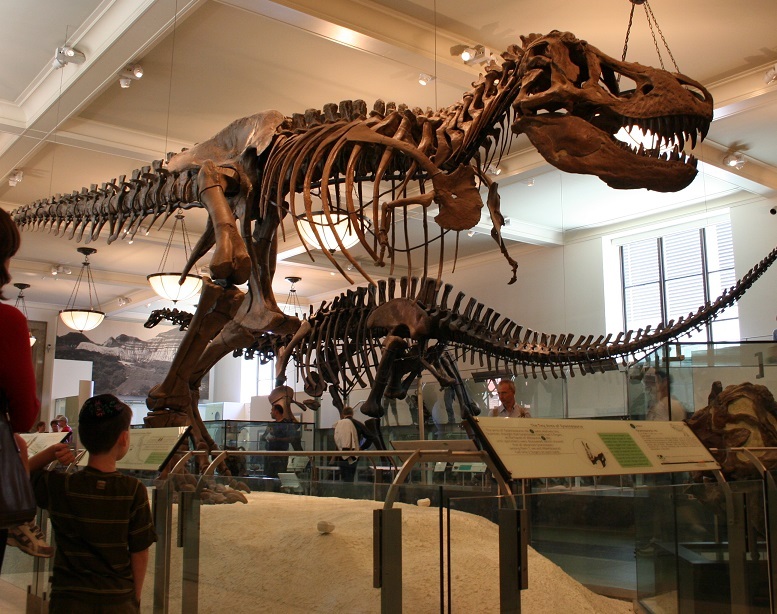 Whether they ultimately claim that dinosaur bones are an incredible work of art created by God, or that they lived before the Flood, one finds that Orthodox YECs simply do not want to discuss the topic at all. This is especially significant in that dinosaurs are probably the most basic of all Torah-science questions. In fact, this is one of the reasons why I put a photo of the skeleton of a Tyrannosaurus rex on the cover of The Challenge Of Creation - not just to scare away charedi readers, but also to stress that I am willing to confront dinosaurs. Perhaps the most striking example of this aversion to confronting dinosaurs is with Rabbi Moshe Meiselman's Torah, Chazal and Science. Despite the book being over eight hundred pages long, it does not once discuss dinosaurs! The only reference to dinosaurs at all in Rabbi Meiselman's book appears on p. 531, where Rabbi Meiselman rejects the approach of the Tiferes Yisrael that dinosaurs are from a previous epoch. He also indirectly expresses a viewpoint on dinosaurs in a footnote on p. 500, where he refers to a change in animal behavior after the Mabul, and references the Ramban to Bereishis 9:5, which suggests that before the Mabul, animals were all herbivores. That might have been a reasonable suggestion in Ramban's time, but it's simply laughable to propose it seriously today. Is Rabbi Meiselman claiming that Tyrannosaurus rex, velociraptors, and saber-toothed cats all ate grass and leaves?! Aside from the fact that their physiology clearly shows that they were carnivores, we actually have fossilized remnants of their stomach contents and excrement, which show that they were carnivores - as well as a famous fossil of two dinosaurs that died locked in combat. While Rabbi Meiselman does not explicitly discuss dinosaurs, he does tell us what he believes to be the (only legitimate) approach to the age of the universe. Unfortunately, his approach to this is rather muddled. Often he says vaguely that "time was measured differently back then", which could theoretically mean that there was indeed an age of dinosaurs, but he also insists that it is forbidden to modify traditional beliefs regarding the universe being a few thousand years old (p. 493). He further claims that there is no legitimate scientific evidence challenging this because the laws of nature were different back then and thus all methods of dating the world as being more than a few thousand years old are invalid. Rabbi Meiselman claims that scientists have no way of knowing otherwise, and that all their conclusions are based on an unproven premise that the laws of nature were always constant. In a previous post, I have noted that the consistency of historical processes is not a presumption of modern science. Rather, it is a conclusion, drawn from observations of the uniformity present in geology and other phenomena. This was the subject of the very first post that ever appeared on this blog, William Smith and the Principal of Faunal Succession. But aside from all the scientific evidence that the laws of nature were not different back then, what about the dinosaurs? And the therapsids? And the woolly mammoths? Forget abstract jargon about radioactive decay and cesium atoms. Think about something tangible and familiar, such as animal life. 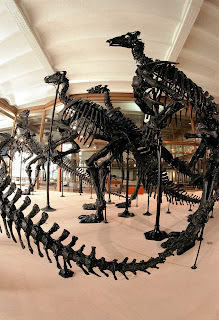 The fossil evidence clearly shows that there were dinosaurs and all kinds of other creatures which lived before people (since no fossils of contemporary creatures are found in the same strata). These animals lived and died and fought and ate and bred - we even find dinosaur nesting sites. Did all that happen in the space of twelve hours? Did it happen in a universe in which the laws of gravity, the speed of light, and everything else - the very fabric of natural law - was drastically different from what we see today? 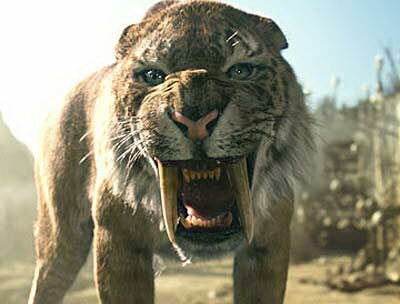 And it's not as though there was only one period of prehistoric creatures. The fossil record shows beyond doubt that there were numerous distinct periods. The therapsids lived before the dinosaurs; the dinosaurs lived before the mammoths. And even among dinosaurs, different layers of rock reveal distinct eras. Stegosaurus, Brachiosaurus and Allosaurus are never found in the same layers of rock as Tyrannosaurus rex, Triceratops, and Velociraptor. The conclusion is that each existed in a different period; the former lived in a period which has been termed the Jurassic, while the latter lived in the Cretaceous period. This is not part of some evil conspiracy by scientists, nor the result of mistakes on their part. Any paleontologist could win instant fame by finding a Tyrannosaurus rex fossil in Jurassic rocks - but nobody has ever done so, which shows that T-Rex lived much later, in the Cretaceous. We see in the rocks that there were countless generations of all kinds of animals, living in distinct periods, leading ordinary animal lives. This is clearly a process that takes many thousands, even millions of years. To describe it as all occurring in one day is simply ridiculous, unless one is taking the word "day" to mean something other than "day." It is not remotely meaningful to talk about "time being different back then." Countless generations of creatures lived and died, in distinct eras - how is it not legitimate to describe that as taking a long period of time? In fact, I would say that an even stronger question is, how can you write an 800 page book purporting to present the sole legitimate perspective on these topics, and not even address this most basic of questions? Have you never even thought about it, or are you really that afraid to confront it? If the former, then you have no place presenting yourself as an authority on this topic. If the latter - well, then even the Christians have you beat. If someone claims to be an authority (and especially if they claim to be the sole authority) on Torah and science, and yet they show that they can't even discuss dinosaurs, then they've been caught with their trousers down. Let's beat that horse! Here we go! The only way (IMHO) you can have your 6 days and 13.8 billions years too is to rely on the scientific fact that time is experienced differently depending on the observer's relative velocity and/or gravitational field strength/topology. This would allow for 6 days in one frame being equal to 13.8 billion years in another. The problem with this answer would be why the Torah would discuss a vantage frame that is unknown to us in which the Universe was 6 days old at the first Shabbos (there are infinity-many such frames of reference, but as of now, none of them have any special significance). However, this is far preferable (IMHO) to the difficulties of why the Torah would write a creation story for a timeless book in terms of the language of man of ancient stories/theological ideas. Also, there are Midrashim that could be read in support of the time-frame idea ("Until here we are counting [time] by the counting of the world/Universe, from here and going further we are counting [time] by a different counting" MR 9:14), and other midrashim (and other sources) stating that the Universe is quite old indeed. Thus, the picture that emerges from modern discoveries is as accurate as the evidence allows, and the Torah was simply unconcerned about pre-history and uses a different reference frame to discuss the length of time creation took. (perhaps so we could have a 7-day week with Shabbos). I think that the paragraph beginning "The only way" starts strong but finishes weak. The reason that the relativity/13.8 billion years = 6 days/Gerald Schroder answer is so unlikely to be emesdik is precisely because, as you say (without using the expression) "dibra Torah B'lashon B'nei adam". The Torah speaks in the language of humans. Nobody, even physics PhDs, says that they will get back to you tomorrow when they mean in 7 billion years. (For that matter, time dilation in the scale imagined only occurs at speeds in excess of 99.99% the speed of light. Why one day would be described from the vantage of a traveler at 99.9999% c (the constant speed of light) and another day at 99.9995 c defies explanation. (The percentages I just gave are approximations, not based on my checking the graph now, but on the fact that extreme time dilation requires extreme speeds approaching infinity). So dibra Torah etc helps explain why that doesn't work well. That exact same idea, Dibra Torah Blashon B'nei Adam, precisely explains why G-d would dictate a story to Moshe in terms and a style which recent slaves in Egypt would understand. Timeless book or not, the torah was given to actual people. While this may sound strange, or somehow against the idea that the Torah is given for every generation, it really isn't. How about the grammar and syntax of the Torah? Do people in modern-day Israel speak that way? Do people in 14th century France speak that way? Do people in your household speak like the characters in the Torah, in the same language as the Torah? Of course not! By definition, the Torah;'s syntax, grammer and style, while it has timeless messages, is not the syntax, grammer, and style of every generation. It was written in a language which was most understandable to people of that time. The Rambam hints at a similar idea. He writes in Moreh (and I am about to paraphrase him, but hopefully this is not a distortion) that korbanos were given because this was the religious language of the pagans, the kind of worship which the Bnei Yisrael were used to. I recognize that this is not congruent with some other ides in Chazal, but I have no problem with the Rambam's idea that the Torah would make commandments in terms of ancient man. Chazal seemed to be pretty sure that in reality the world was created in 6 24-hour periods. Otherwise the discussions about whether it was created on the 25th of adar or elul are nonsensical. I recognize fully that, as a nod to the idea of an old world, we choose to read those chazal as allegorical. But a more correct description is that we choose to learn the lessons imparted by either view and preserve those lessons by forcing an allegorical-interpretation on what does not appear to be allegorical at all. Thank you for your brilliant put-down of "Rabbi" Moshe Meisleman. What took you so long? Please, a little more respect. Does he really deserve any? He is dishonest to the extreme and engages in slander and character assassination. I don't know what that even means. Did you see http://zootorah.com/controversy/ravmeiselman.html? yes, he does deserve more. Wow, that's a plain loshon hara. I would advise its author to spend more time with Chofetz Chaim instead of dinosaurs. Why does it seem that accusations of Lashon Hara are only leveled against people we hate and want to silence? Elon Weintraub funny you would mention Lashon Hara. These are not new arguments, and they have been stated by supporters of the 5775 model for a long time, so I'm not sure what new material you have brought to the table here, aside from possibly venting your legitimate anger - legitimate to have, illegitimate to vent in a public venue. In any event, I wish you would clarify your objection to the argument that God created an old looking universe, and that he built into all the components that would make it appear old to an observer who did not accept the Torah teaching that it is in fact only 5775 years young (if there is in fact such a teaching). Saying that you are at a loss for words, or that you are surprised anyone would take such a thing seriously does not answer the intellectual content of the argument. I must admit that the argument does not sit well with me either, but I have a hard time putting my finger on the intellectual hole in it; feeling uncomfortable does not equal a refutation, and neither does disparaging the intellectual capabilities of those who take such a thing seriously. I have heard this argument put forth most cogently and clearly by Rabbi Dovid Gotlieb here: http://www.simpletoremember.com/media/a/evolution-age-of-the-universe/, whom I am sure you greatly dislike, but who despite that make a very clear case for this position, both philosophically and from sources such as the Rambam who makes a similar argument. "Saying that you are at a loss for words, or that you are surprised anyone would take such a thing seriously does not answer the intellectual content of the argument." You do realize that Slifkin authored an entire book on this -- would you have him elaborate here for thousands of words? Slifkin has satisfactorily replied to these points there. Bravo, Eli Julian! Your thoughts are my thoughts and more eloquently expressed. I never quite understood the "God wouldn't do that" argument against the "old-looking world" hypothesis. After Auschwitz, how do we claim to begin to understand anything God does or does not do. One major problem with accepting the "new earth appearing as an old earth" hypothesis is that to accept such an approach, one would have to posit that G-d created an elaborate facade utilizing multiple lines of fabricated evidence - astronomy, molecular biology, genetics, comparative anatomy of extant and extinct organisms, etc. to create a very convincing appearance of an old earth. You would have to posit that life so very convincingly appears to have developed via evolution - based on fossil record, based on comparative anatomy, based on genetic evidence - only because G-d created it all to appear that way. You would have to say that not only did G-d create the world to look old, and life to look like it evolved, and fossil evidence to support the idea that life evolved, but He even fabricated evidence of real life dramas. That includes fossil evidence of extinct animals caught in the various acts of living. But it also includes thousands of years of human civilization – cave paintings, primitive tools, even some cities, and remains of earlier Homo sapiens, all caught in the act of living and dying, all predating the earth’s proposed start date of 5775 years ago. You would have to say that G-d created man – and all current life – in current form on a world with a history already in place, a history of slow evolution from earlier life forms, of prior life dramas, of prior civilizations, of prior living, breathing humans, but a history that never actually occurred, planted here on the surface of this planet, only to give the appearance of an old earth..
Now you can answer that G-d is both omnipotent and inscrutable, that He can and did indeed create the facade, and we will never understand why. That is an alternative. But here is the choice. You can choose to believe that the all the evidence before your eyes is an elaborate fiction, created by G-d for reasons we will never know. Or you can accept the evidence set out before you, that the world is indeed billions of years old, that G-d used chemistry, and physics, and molecular biology, and the mechanics of evolution to create this wondrous world that we have. I am not sure why someone would choose the former approach over the far more straightforward latter approach. What would the difference really be between creating a world in 5775 years and making it appear that the world evolved over the past 4.5 billion years to the present state, using the same natural laws and principles we see operating today, and making a world that evolved over 4.5 billion years to the present state, creating those laws and principles to match the apparent evolution that never happened and keep the universe running forward? The outcome is exactly the same. It's possible, as there is no change from our perspective. But it doesn't really state anything about the order of the world and its natural laws. It is not so much about what G-d could have done, as it is about deciphering the most likely way He did it based on the available evidence laid out before us. Could an omnipotent and inscrutable G-d have created a new world that looked like an old world for reasons unknown to us? Is it possible that all the empiric evidence is a divine fabrication, that current life forms only appear – based on multiple lines of fabricated evidence - to have evolved from earlier life forms, that modern human civilization does not in any way descend from or have any direct relation to the apparent remains of human life, habitation, and culture that existed before 5775 years ago? Is it possible that the omnipotent and inscrutable G-d then proceeded to cover His tracks, at some point following the flood drastically altering the genome of all existing life forms to have the genetic diversity present today that could only be otherwise explained by existence of the various species for far longer than 4000 years? Sure. But why would you accept such a convoluted hypothesis when the simple and straightforward alternative is that G-d created the world through a process consistent with the evidence before your eyes? To accept otherwise would be no more logical than finding a rock and assuming that it is perfectly reasonable that the rock suddenly sprang into existence the moment you saw it, because an omnipotent and inscrutable G-d can do such things though we cannot understand His reasons. As an aside, much of our knowledge of modern science is based on acceptance of an old world. In the area of biology alone, so much of what we understand to be true relies on evolutionary theory. Now that the heavy lifting has been done and the mechanisms of biology are accepted, is there harm in a given individual accepting the conclusion, but rejecting the groundwork that led to it? I suppose not. But it can lead to rather interesting situations. I remember reading an Orthodox produced magazine directed at children discussing science from the perspective of one accepting the world as being 5775 years old. There was one article that attempted to poke holes in the evidence for an old world, in essence saying, yes G-d did set in place evidence of an old world, but flimsy evidence that anyone who is smart enough without ulterior motives should be able to see through. The funny part is that a separate article discussing the wonders of G-d’s world mentioned a specific species which it described as “closely related” to a different species. Without accepting evolution as the likely mechanism of creation of life on earth, it is not really possible to speak of various species being related in any meaningful way. They would simply be totally separate creations that happen to have a lot of genotypic and phenotypic similarities. Atheist, you might recall that some but not all theists believe there is rhyme and reason and some lesson in every detail of nature. Switching from "young earth" to "old earth" doesn't answer your "why" questions. Why were somethings made earlier (and are now older) and other things made later (and are now younger). And who needs the greater cosmos in the first place? If an "old earther" has answers to these questions then a "young earther" can use those answers too, only say the various ages are a farce in order to teach us the same things which the "old earther" learned from them. The difficulty with this is that why should G-d trick us? That's a separate (and valid) question but not your question. But I only say this to your objection that it's too "inefficient" for G-d to make a young pre-old earth. I assume G-d can survive that. The real problem is that it's too "false" for G-d to make a young pre-old earth. His seal is truth, and falsehood is morally wrong. Why would he engage in it? As it were, He is "forced" to be patient for those billions of years in order to be a Model of moral rectitude. @Yosaif - have you studied how the Earth evolved form cosmic dust over millions of years ? If not do so. The same happened for billions of other cosmic forms. So think about the logistics how a young Universe could have been created and yet appear to be an old universe which has billions and billions of cosmic forms all at different ages ! Is it is consistent with evolving cosmic forms; by the way which happen to be still evolving ? @Yosaif you said "But I only say this to your objection that it's too "inefficient" for G-d to make a young pre-old earth. I assume G-d can survive that." MY comment was not meant as disproof to supernatural being(s), merely to show a reason or two the unreasonableness (in my opinion) of a young Universe created by G-d. But since you brought it up - reconciling Bereshis with Cosmology in an intellectually satisfying way is real problem for people who think the Torah is divine. LIke you said - why would an alleged moral G-d put all these 'falsehoods' in the Torah. And the the 6000 year earth is only part of the iceberg. The “G-d” that you’re atheisting about isn’t the same “G-d” that I’m theisting about. Logistics is relevant to yours and not to mine. Purpose and morals are relevant to mine and maybe also to yours but I’m not sure. If you review our give and take you’ll see that this is why some of your questions aren’t relevant to me, some of my questions aren’t apparently relevant to you, and other questions are relevant to both of us. I read up on dust to earth. A good rule is to never get into a debate on any subject about which one book tells you it is totally explained and another book tells you it is totally unexplained, unless you want aggravation from extremists on either side. I must also add that woe unto me that I instigated חילול שבת. I occasionally study with someone who studied in and around a well known yeshivah and with some famous תלמידי חכמים until his mid-twenties. Then he experienced a certain trauma and left Judaism for over forty years. (My metaphysical speculation is that was due to his father taking him to non kosher restaurants as a child, while leaving his sisters to eat at home; they are married to some well-known תלמידי חכמים.) After all this time he came back. As Berra said, it’s not over till it’s over. Be well. "These are not new arguments,"
Rabbi Meiselman's presentation has some new twists and a veneer of scientific respectability, so it needs to be exposed. "In any event, I wish you would clarify your objection to the argument that God created an old looking universe"
You realize that that is not Rabbi Meiselman's approach, and not what we are discussing here, right? That is the Omphalos approach, and I explained its logical flaws in The Challenge Of Creation. "I'm simply lost for words that such a proposal could be put in print, and that a book espousing such a thing can be taken seriously by anyone." Rabbi Slifkin, I think you are missing the point. This is not a book for scientists. This is not a book for intelligent people. This is not a book for rational people. This is not a book for anyone who thinks. It is simply a book for Haredim. They would read used toilet paper as long as it has the proper Haskomot. Bill, you say that the book isn't for anyone who thinks, only for unthinking Haredim. But what does the author say? Does he think that his book is good enough for rationalists, MO etc.? Is he upset with and condescending to whoever doesn't see things his way? If he is, we should explain why we beg to disagree. There's also no reason why not to explain in public, if his book is available to the public. Had he written a private book, only one or a few copies, and sent it to Rabbi Slifkin, so Rabbi Slifkin should rebut him privately. But once he went public Rabbi S can go public. 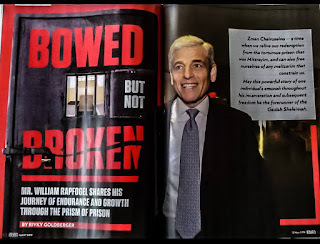 An admirer of Rabbi M wrote an article against Dr Schroeder. When someone complained about that he said that once Dr Schroeder went public he can go public. I think he is correct, and likewise Rabbi S is correct. Obviously, you are not a scientist, intelligent, or rational person. THE BOOK DOESN'T HAVE HASKAMOS. For Bill The Litvak apparently the only intelligent people are apikoros, while Torah Jews are not among those who thinks. I wonder if Bill realizes how he makes moron of himself? Modern physics discusses the expansion of the universe and how time is expanding as well. I heard a lecture once that posited because of the expansion of time, what today we measure in millions of years, might have been at the beginning of the universe a few 24-hour days. Of course, using today's standards to measure time that way involves considerable logical twisting, but it would be one way to resolve the conflict in viewpoints. The major problem would be, those who take the span of time as literally six of today's 24-hour days, probably do not accept modern physics' theories of expansion of time and the universe. This is precisely Dr. Nathan Aviezer's argument in his book, "In the Beginning: Biblical Creation and Science." This relativity discussion is a bit unhinged from the reality of physics and common sense. What we measure as millions of years could not have been a few days at the beginning of the universe. Within a given frame of reference, time flows at its normal speed and EVENTS occur at normal speed. Thus, if you and your family were to travel at 99.99999% (not exact) the speed of light, you could leave earth and come back after 10 generations had passed on earth, and it was just 5 years for you . But had you done so, you could not have had kids who then had grandkids in that time ---- within your frame of reference, only five years passed, so only five years worth of events could occur. So when scientists say that it took 9.3 billion years from the big bang until our sun formed, they mean it took that long. None of this "what we measure as billions would have been measured then as just days". Nope, billions of years. What I believe Schroeder argues is that from a DIFFERENT perspective, NOT the one of the actual events, time could flow at a different rate. My comment here doesn't prove or disprove in any way what Schroeder rights, but I am clarifying the thought that time occurred differently in the early universe. It's not what he says, and it just ain't so. CJ Srullowitz, I don't think Prof. Aviezer argues that at all. I think that's Gerald Schroeder's argument. "But had you done so, you could not have had kids who then had grandkids in that time ---- within your frame of reference, only five years passed, so only five years worth of events could occur. " What I meant was that, you could not have had kids who were born on that spaceship with you and stayed on that spaceship with you, and they then grew up, had kids, etc --- all on that spaceship while traveling with you.... etc. Schroeder's book the Science of G-d is full of errors, some very subtle - I think I have written about 8 posts on that book. Bill: But the book doesn't even have haskamot. I believe in your overall programme, but talk of dinosaurs has always left me cold. In my own lifetime, I have seen complete overhauls from the names and descriptions of dinosaurs I saw in my youth, to what I see now. (Some of the major dinos aside.) I've also become more aware of the enormous amount of guesswork involved with paleontology as it relates to dinosaurs, and of the reality that most ordinary citizens never actually see real dinosaur bones. Everything we see are models, what we are TOLD to believe are true-life reproductions, but are never given the chance to evaluate for ourselves. And the models we see, of course, are not only man-made, but usually extrapolated and then constructed from only a few bones. Add those specifics to the general knowledge of what, in 2015, we are more aware of today than we were 50 years ago, which is that scientists have agendas the same way anyone else does. They are not the white-coated pristine guardians of knowledge, above petty financial considerations and personal ambition, that, in a simpler time, we once thought we were. In my professional life as a lawyer, and in my personal life as a reader, I've seen countless "studies" or pronouncements of scientific experts that just cannot stand up under scrutiny, and in many cases are predetermined to meet the prejudices of the scientist conducting the study, or the person paying for it. They have dogmas and beliefs in which they are just as zealous, and unforgiving of dissenters, as the most religious fanatic. In many way, actually, they are even more extreme. They are no more entitled to unquestioning faith than the religious witch doctors they reject. Does this mean there were no such thing as dinosaurs? Of course not. But there are others reasons to understand the first chapters of Genesis allegorically, or, if you prefer, as occurring over millions of years. There were rishonim who held this hundreds of years before archaeopteryx, however you spell it. At any rate - as you wrote about the MBP controversy - whether one agrees or not, one should show some awareness of the other side. That is not true. We have found almost complete skeletons. And while there were major innovations in the discovery of correct dino posture and the discovery of preserved pigments and feathers, there was never and will never be a point when paleontologists go, "My God! That is just an elephant we put together wrong. I guess dinosaurs didn't exist". Theories change and collapse, but usually they are only modified. And the old is still broadly accurate. Newton was wrong about gravity, but we still use his mostly correct theories for large objects with low velocities and masses, where relativistic and quantum effects aren't important. Marsh and Cope got a lot of things wrong about dinosaurs and behavior, but we still broadly use their classification scheme. Now I also see that you are conflating actual slow, methodical science work with pop-science writers and with catchy headlines. It is true that 90% of the studies you read in newspapers are sensationalist things that don't pan out, but they really don't have much effect on the actual incremental gains of the field. The ever strobing "Chocolate is good for — Chocolate is bad for you" is blurred into slow improvements in our knowledge of the digestive, endocrine, and vascular systems. Every once in a while something truly unexpected like relativity comes along, but even that is incorporated, tested, and slowly built upon. Using this as a straw man to argue for a viewpoint held by certain fundamentalists, whether motivated by religion, hatred of medicine, or just contrariness makes very little sense on examination. It might be a good idea if confronting a T-Rex to have one's pants down, one might soil themselves. Better a T-rex than the raptors. 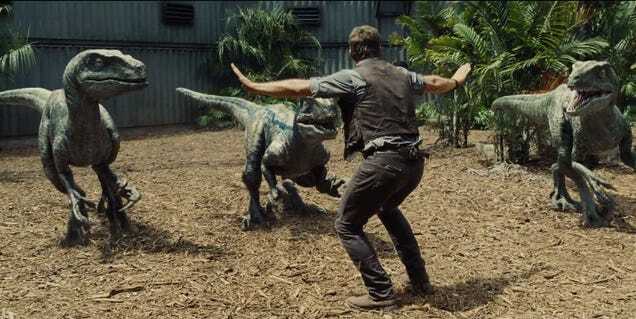 At least according to some deot, you can outrun the T-rex. Why does your feeble minded human brain (just as my brain is) need to be able to comprehend something in order for it to be true. Who says that God in all his wisdom is confined by the restraints that your brain perceive. All your books are based on facts and science and logic and immediately disregard the scientifically impossible. If science and "tevah" were created by god, it is only logical to believe that he can modify them as desired. Unless you believe that science "created" god with is the exact opposite of the Jewish religion (or any religion fo4 that matter). Of course Hashem can modify the laws of science however He wants. That has nothing to do with this. We are talking about what we see that He actually did, not what He could have theoretically done. However, R Gifter is also critical of science, See there. The argument that--compared to God--man is feeble-minded can be used to justify belief in all manner of nonsense. We cannot understand a God who would send his only son to earth to be tortured, but perhaps God can understand it. Or a God who impregnates a human female. Or a God who--like Moloch--delights in child sacrifice. Using this logic, nothing about God or his actions needs to make a whit of sense. Anything goes. Saul, true. But it depends on the context. If someone claims the earth was created old, just so, he's opening the door to the spaghetti monster. But if he does it to defend literalism that he believes in (i don't, BTW) so it won't go further, if he's honest. "Who says that God in all his wisdom is confined by the restraints that your brain perceive." First, we're talking about God's creations, not God himself. Big difference. Rabbi Slifkin once made a point about the eglah arufah - when a corpse is found in a field, suffice to say we can't assume God created bones in the field to fool us, but instead we accept the reality that a previously living being has died. And when we see evidence of an old earth with remains of creatures that lived well before human beings, we must accept that also, especially when there are many Jewish sources that hold by a non-literal 6 days, well before science indicated there was a reason to. I'm not singling you out for this, Beginner, but these are sad and strange times we're living in when adherents to Judaism (kal vchomer its leaders) need to be reminded that observation counts more than dogma. Unfortunately your last line ruined a typically interesting post. While I fully identify with your hashkafa and ideas, I don't identify with your style and verbal jabs. DF, your critique of scientific findings, particularly with regard to dinosaurs is unfounded. There is a huge difference between some individual scientist being paid by his party to testify in a trial on some scientific matter and the conclusion of virtually all paleontogists on the existence and time interval of dinosaurs. The rock layers in which dinosaur skeletons and bone fragments are found start at some 200 million years ago and end abruptly at 66 million years ago - based on radiometric dating of these rock layers using a number of different radioisotope decay measurements (not carbon-14). No one suggests that humans or even primates existed then. I'll let R' Natan answer the question, should he wish, as to what museums have virtually whole dinosaur skeletons on display. Your skepticism about scientific knowledge of the size and structure of these creatures is unfounded. Nor would seeing what purports to be real dinosaur bone satisfy a skeptical public who couldn't distinguish between a dinosaur bone or a mastodon. If virtually all the relevant experts agree about a matter, it takes on credibility. The naysaying of laypeople be they lawyers or roshei yeshiva doesn't give their viewpoint equal credibility since they simply don't have the relevant knowledge and background to evaluate the evidence. The case of R' Moshe Meiselman is different. He does have the training in math and physics to evaluate issues of age determination, but insists on dismissing evidence of an ancient earth with ad hoc protestations that matter and light functioned differently in the first 'week' such that 1 week then was equivalent to billions of years since. The virtual absence of dinosaur mention in his lengthy book is an indication of its lack of objectivity. Y. Aharon, very well said. Y. Aharon (and Elon Weintraub, above) - I take your points. My point, in turn, was not to cast aspersions on the entirety of the scientific enterprise, which would be nonsense. Rather, to express some much-needed skepticism in the fervent belief some have in the church of science. I'll leave it at that for now. I worked in the field. I know well this Church of Science. And unfortunately, the most vocal scientists and non-scientists (Dawkins, for example has done no science in 30 years and never done the astronomy he presents himself doing on TV) are the ones best suited to making unsupported bombastic statements to the Press and to Courts. But I don't really think it has relevance explaining what dinosaurs are. The last line and the last photo are beneath your dignity. You must preserve your dignity not only for your own sake, which is reason enough, but also in order not to arm all the sundry of opposition with red herrings with which to "prove" (ha ha) that their (false) opinions are the sole truth. 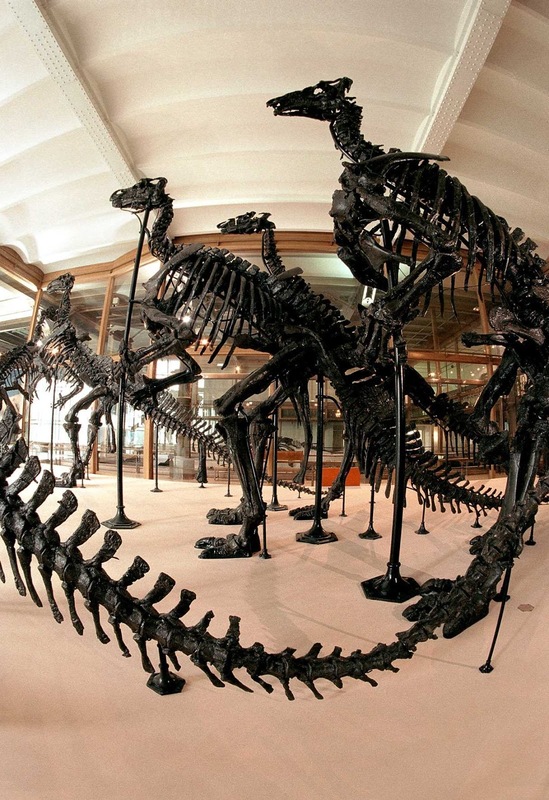 "as well as a famous fossil of two dinosaurs that died locked in combat." - did you mention this in order to prove that they were carnivores? Have you never seen two vegans fight over a tofu burger? Didn't they also find skeletons of two ruminants whose antlers were entangled with each other? I was wondering the same thing this week. there are professionals and amateurs, PHDs and Undergrad level students in every field of study who make contributions of their "chiddusim" to their field. Most of the time the contributions from the PHDs are accepted more than that of an undergrad students who by nature have not been brought fully through the formal system of university. You'll also notice that about alot of those who write about science and torah who have actually not been through the formal system of being on the level of a PHD in the fields of science. Im just wondering (please don't take this as chutzpa), if you have a PHD in anthropology/Biology where you can write about this on a professional level and if not why can one of a layman level (i.e. no formal university education to a Masters/PHD level) write on this topic. once again I mean no chutzpa in the question just wondering for my own knowledge. I don't see R' Slifkin's comments on palaeontological or zoological issues as being so cutting-edge that they require the credibility of someone with a PhD in the field. They are based on pretty well-established and non-controversial ideas. as a point of validity how can you trust any scientific fact that is not referenced back to a higher level source (i.e a university study/ a well accepted biology textbook) when R' Slifkin argues on points in Rav Meiselman's book. Rav Meiselman has a PHD in mathematics and made contributions to his feild of study, This may be a genetic fallacy on my part , but if you're not a scientist, and you are writing a layman level (ie. not brought through the formal system of studying science) then how can you argue on one who has a PHD Math/Physics/Biology/Chemistry (this is a general statement). this is equivalent to having a guy with a degree in business telling the surgeon he has a better Idea of how to do surgery. Your average guy reading this blog probably does not have more than a undergraduate degree in the sciences (not to belittle those who read the blog) that being said if there is a reference back to studies/journals published by a university that one can look at and see for themselves. Oy vey. Let me explain. The idea that the universe is a lot more than a few thousand years old is not some sort of chiddush that I need a PhD in science to prove. It agreed upon by the entire global scientific community (except certain religious fundamentalists) to be a basic fact supported by countless lines of evidence. I am simply reporting that fact. Even R. Meiselman would agree that the entire global scientific community holds that way. R. Meiselman wants to dispute it. His arguments have no merit (as I have shown), and he certainly doesn't have any authority to do so. He is not a scientist *at all*. Mathematics is not one of the natural sciences. (see http://www.rationalistjudaism.com/2011/05/denying-dinosaur-eras.html) He has done nothing more than a few college courses on science. Would you trust a someone who has done a few college courses on surgery (=R. Meiselman), but is regarded by the ENTIRE medical establishment as being a crazy fool, to do surgery? It should just be mentioned that the rock layers are exactly the thing the Tiferet Yisrael deals with. I think dinosaurs also are important because they are the first thing kids deal with. Kids don't know about evolution, but they know about big scary animals. Here's a story: In my elementary school, we had two second grades. Our rebbe was out once, so they put us in the other one. We must have been learning about Noach or something, because I brought up dinosaurs. They must have been well-prepared, because every kid in that class sang out, "There were no such thing as dinosaurs!" Me: But they've found all these bones! Rebbe: Hashem put them there. Me (seven years old, but able to spot nonsense when I encountered it): Why would Hashem put bones somewhere? Rebbe: I don't know. Maybe He wanted to make chulent or something. The class chuckled and I realized it was a good time to let it drop, mentally shrugged and rolled my eyes, and that was that. "The museum will be entirely non-controversial. There will be no dinosaur fossils, and nothing relating to evolution." I honestly don't understand what you are saying. 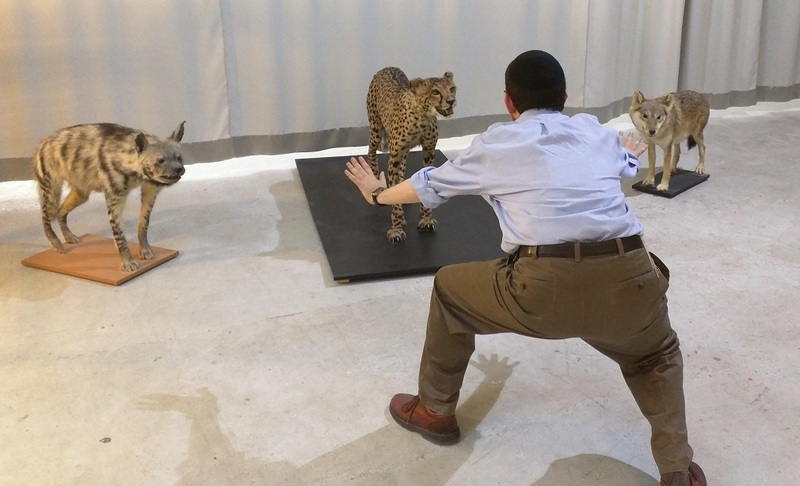 My museum is not designed to address Torah - science conflicts. The Tiferet Yisrael on fossils was mentioned in one of the comments. TCS claims that Tiferet Yisrael was "utterly rejected". The sad joke is that his own Uncle Ahron ztz"l adopts the Tiferet Yisrael (Logic of the Heart Logic of the Mind page 54). Rabbi Slifkin: I do not understand why you see dinosaur fossils as 'the most basic question' in the Torah and science discussion - in what way are dinosaur fossils more problematic than those of the other prehistoric and pre-human species? They're not. But dinosaurs are more on people's minds than therapsids and ammonites!